Giuseppe Conte (Italian pronunciation: [dʒuˈzɛppe ˈkonte]; born 8 August 1964) is an Italian jurist and politician. 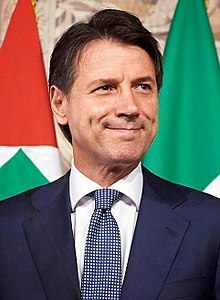 He serves as the 58th and current Prime Minister of Italy since 1 June 2018. ↑ "Raggiunto l'accordo per un governo M5S-Lega con Conte premier" (in Italian). This page was last changed on 14 June 2018, at 21:20.